Just sharing some pictures taken around the city while at work, at lunch, on the way home, etc. 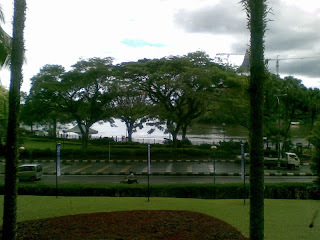 This is view of the Kuching Waterfront with shady trees and Sg. 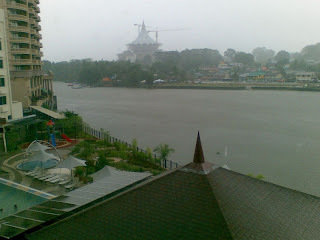 Sarawak (Sarawak River) from the Hilton one rainy day. 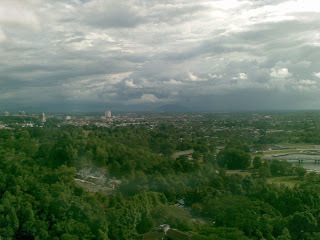 This was taken from the 19th floor of Menara Pelita. 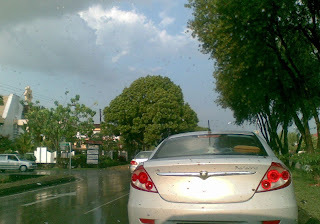 I have been there many many times but just didn't manage to take any photo till this time around. Kuching City is at the background. Notice how flat the land around the City is. Another view of the city from the 19th Floor of Menara Pelita. I will be there in an hour time for another meeting. Was there this morning. 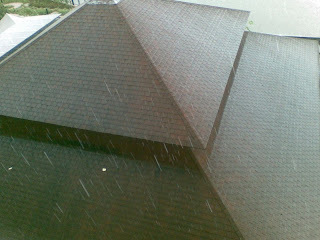 Raindrops at Holiday Inn Kuching. 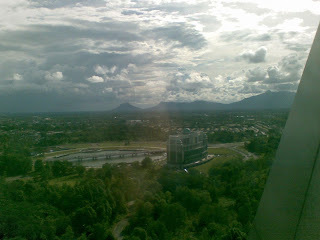 View of the DUN (under construction - look for very sharp roof structure) and Riverbank Suite Condo (top left hand corner) from 3rd floor of Holiday Inn Kuching. The body of water is Sg. 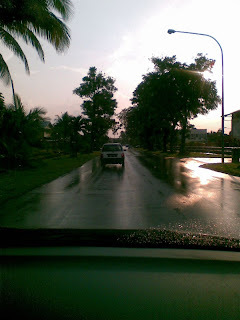 Sarawak (Sarawak River). One the way home one rainy evening along Jalan Laksamana Cheng Ho. Almost home, sun setting at Hui Sing Garden. It's just as rainy over where I am too! Kamu lupa hitamkan nombor plate kereta tu. Sik baik meng-exposekan nombor kereta orang lain. Opps! OK, edited the pix. Changed your name? Fish hmmm fishy ya?